These Chalkboard Sidewalk Signs are Double-Sided! 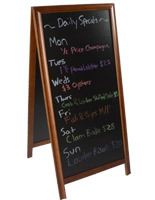 Display These Write-On Marker Boards In Any Entry Area To Attract Attention! 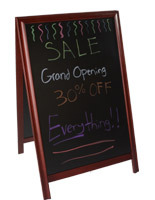 These Chalkboard Sidewalk Signs Are An Affordable Display Option With Fast Shipping! Quality wood frame with dark brown finish for durability and style. 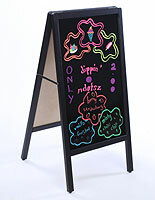 (2) 24" x 36" blackboards for maximum visibility. Compatible with wet and dry chalk markers. Top hinges allow unit to fold flat for easy storage and transportation. Magic eraser included to erase even the toughest of marks. These chalkboard sidewalk signs, also known as sandwich advertising boards, make showcasing written messages to the public easy. Grab potential customers’ attention by simply placing these advertisement boards in storefronts or entryways. 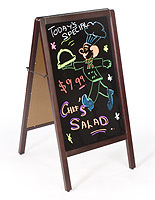 These a-frame chalkboard sidewalk signs are great for displaying new dinner menus, in store clearances, and bar specials. Each marker board features an attractive dark brown wood frame to coordinate with any environment. These chalkboard sidewalk signs that are double-sided can be viewed from either direction. 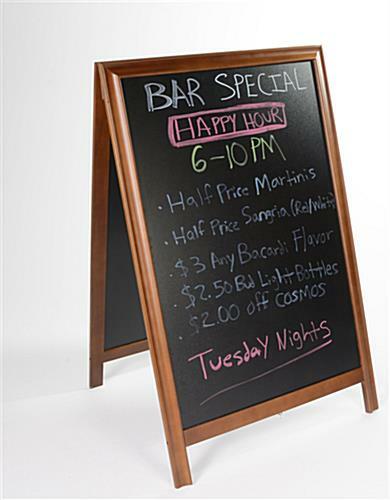 Use these write-on boards to advertise multiple promotions at once. These chalkboard sidewalk signs that are wet -erase make it easy to change advertisements. 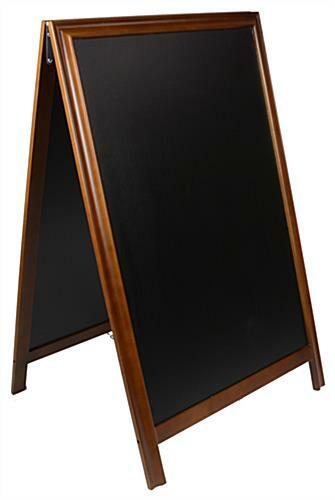 These wooden a-boards can be quickly wiped clean with a damp cloth. These chalkboard sidewalk signs that have (2) 24” x 36” writing areas can be seen from a distance. Write on these sandwich frames with wet or dry chalk markers. These chalkboard sidewalk signs that have (2) black panels make promotions pop, especially when written on with neon chalk markers. Use these retail frames to attract foot traffic into any establishment. These black chalkboard sidewalk signs include a magic eraser. The magic eraser makes it simple to remove even the toughest of marks. 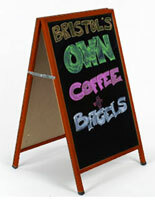 These sandwich boards, chalkboard sidewalk signs are easy to transport from event to event. 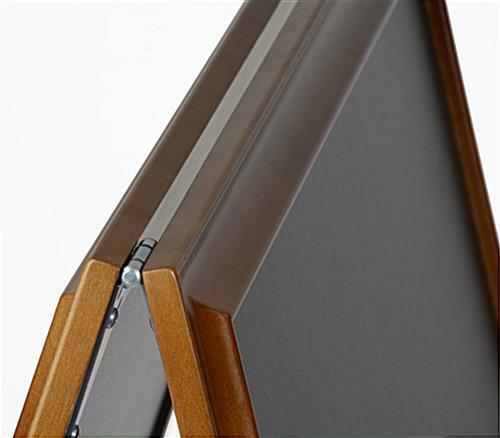 Each a-frame has hinges that allow the frame to fold for storage and transportation. 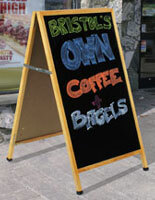 These chalkboard sidewalk signs will help draw attention to any business or event. 28.9" x 46.0" x 3.3"